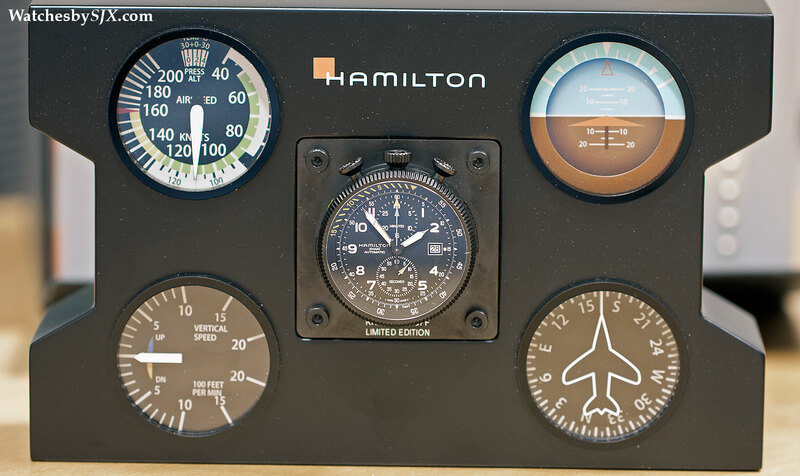 A convertible bullhead pilot’s chronograph created in collaboration with the Swiss alpine rescue service, the Hamilton Khaki Takeoff Auto Chrono Limited Edition can be turned into a desk or aircraft clock with a simple twist. 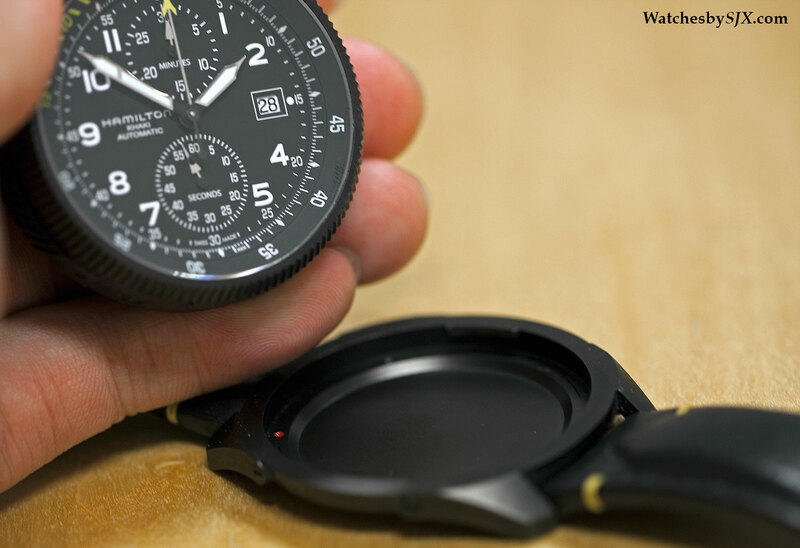 Secured with a twist and lock mechanism like those found in SLR camera lenses, the Hamilton Khaki Takeoff Auto Chrono is actually a convertible wristwatch. 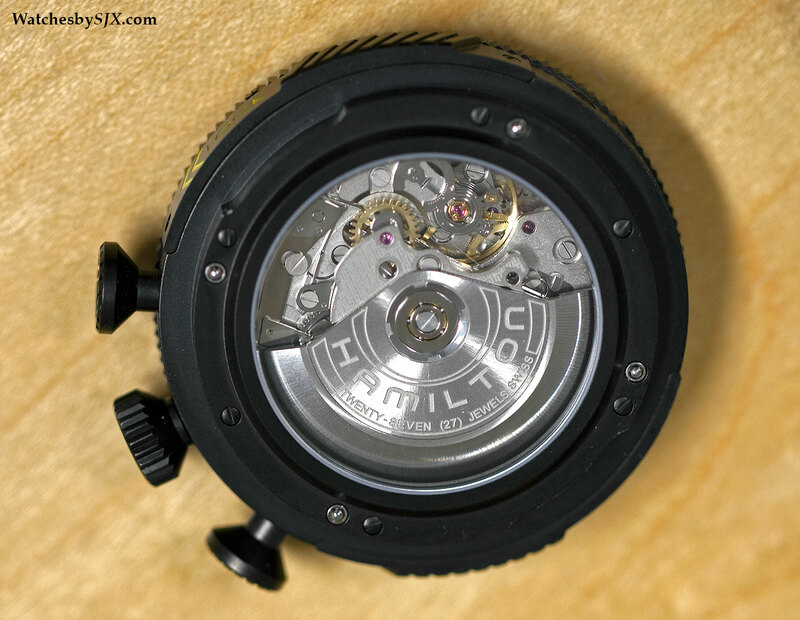 The movement is housed inside a removable case, which can also fit into a desk display stand or the dashboard of a helicopter or airplane. A knurled case band allows for an easy grip to turn and unlock the case. Setting it back into the wristwatch holder is the same process in reverse, with the red dot in the case and watch head serving to align the two. This is the very same mechanism used in the Khaki Navy Pioneer of 2012, which was a wristwatch convertible into a marine chronometer style desk clock. 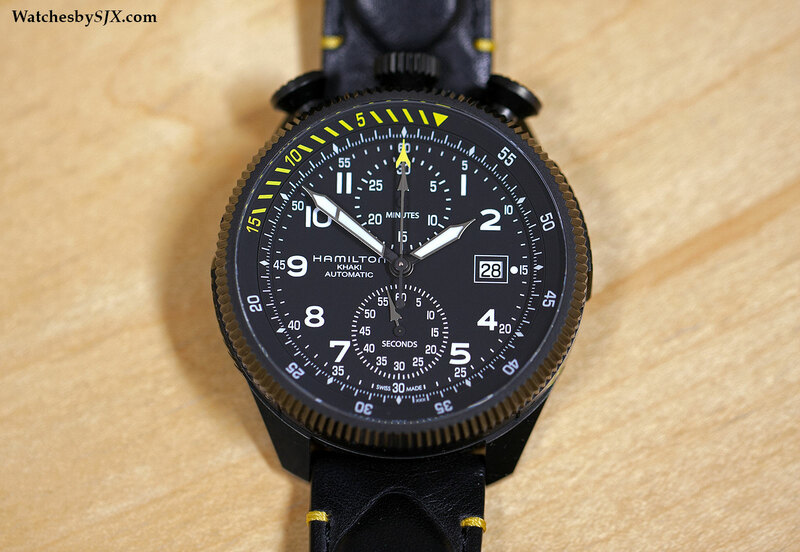 Created as a result of Hamilton’s relationship with Swiss mountain rescue service Air Zermatt – the watchmaker is its official timepiece supplier – the Hamilton Khaki Takeoff Auto Chrono has a 46.3 mm steel case with a black coating. Despite its size, it wears well because of the very short lugs. It is, however, heavy and the stock strap is disproportionately thin. 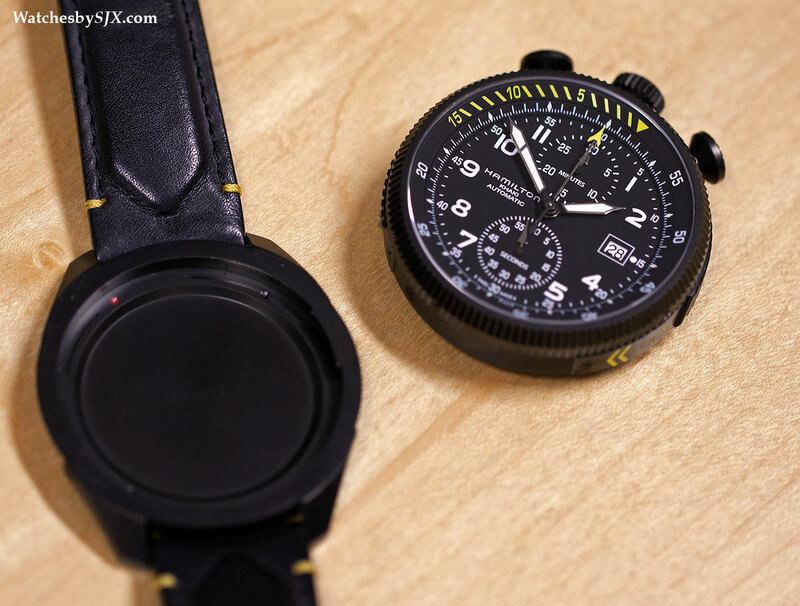 Attractive but a bit generic, the black dial is in typical aviator’s watch style with a yellow accents and an aircraft-shaped tip on the seconds hand. The inner bidirectional bezel is rotated by the bezel. The chronograph is a bullhead-style, with the pushers and crown on the top of the case. The display back reveals the calibre H-31 inside, a variant of the Valjoux 7750 with an extended power reserve of 60 hours; the average is 40-ought hours. While reliable and robust, the movement is not pretty, and has little decoration. 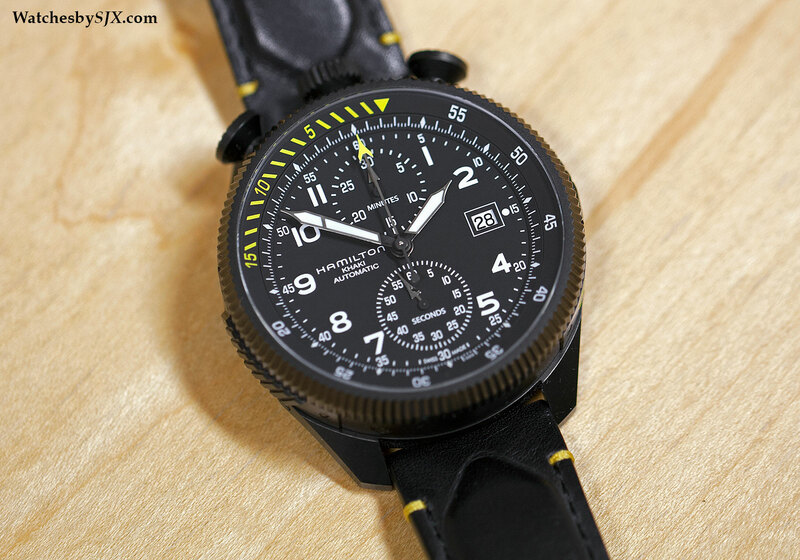 Limited to 1999 pieces, the Hamilton Khaki Takeoff Auto Chrono is priced at US$3295 or 4340 Singapore dollars.